In the past there have been two problems associated with bladder tanks – the possibility of the bladder rupturing and also the inability to refill the unit during operation because it is pressurised. Both of these problems have now been tackled and resolved by SKUM. Unique fixing and support methods now employed by SKUM now ensure the integrity of the bladder while still maintaining the ease of bladder installation and operation. The problem of refilling during operation has also been overcome by providing a pressurised source of foam concentrate from a mobile unit as an optional extra to the basic tank supply. The optional mobile unit also provides a simple means of refilling after operation. Balanced Pressure Proportioning is the most common method used for fixed system applications where pressure or flow can vary with demand. There are two basic types – Bladder Tanks and Pump Systems using Balanced Pressure Proportioners. All balanced pressure systems use a modified venturi device called a proportioner or ratio controller. The proportioners are available in a variety of sizes and styles to match required flow ranges and pipe sizes. As water flows through the proportioner nozzle, a low pressure area is created. It is in this low pressure area that the pressurized concentrate mixes with the water stream. 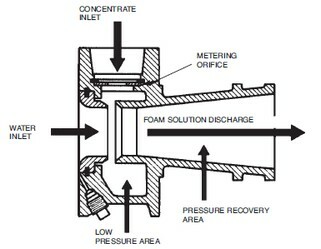 A metering orifice, at the concentrate inlet, regulates the rate of concentrate flow and thus determines the percentage of concentrate in the foam solution. Balanced pressure proportioning systems require the foam concentrate pressure to be balanced with the water pressure at the proportioner inlets. This balance meters the proper amount of foam concentrate into the water stream. Balanced pressure bladder tank systems use a pressure-rated tank with an internal nylonreinforced elastomeric bladder. System water pressure is used to squeeze the bladder containing the foam concentrate providing pressurized concentrate to the proportioner. The resulting foam solution is piped to discharge devices protecting the hazard area. A distinct advantage of bladder tanks is that no external power supply is required other than a pressurized water source. However, because the bladder tank is pressurized during operation, it cannot be conveniently recharged during discharge. Because of their simple design, bladder tanks require very little maintenance. 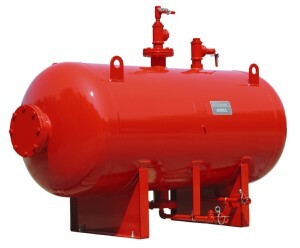 Balance pressure pump proportioning systems use atmospheric foam concentrate storage tanks The tank is not pressure rated and may be constructed of mild steel, fiberglass-reinforced plastic, or polyethylene plastic. Instead of using pressurized water as with bladder tanks, the foam liquid is pumped to the proportioner. 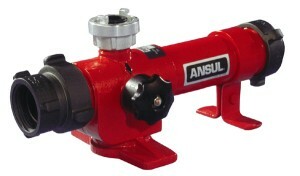 An automatic pressure balancing valve regulates the foam concentrate pressure to match the water pressure. 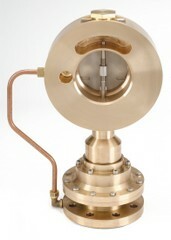 A duplex pressure gauge provides continuous monitoring of both water and concentrate pressures. The system can also be operated manually to control the pressures and isolate the automatic balancing valve. Positive displacement pumps are used with these systems to allow maximum efficiency for liquids of varying viscosity. The size of pumps and drivers will vary depending on the application and the type of foam concentrate used. The in-line balanced pressure proportioner is similar to the pump skid previously described except that it is a separate assembly that offers the advantage of proportioning the foam concentrate at a location remote from the tank and pump. 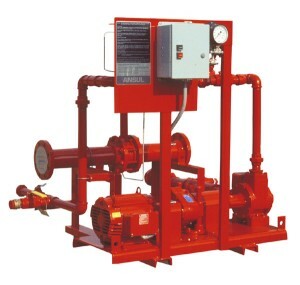 Like the pump skid, the proportioner assembly incorporates an automatic pressure balancing valve, duplex gauge, and hand-operated valves for optional manual pressure regulation. A pressure control valve, located in the return line to the foam concentrate storage tank, maintains constant pressure in the supply manifold that is 15 to 20 psi (103 to 138 kPa) higher than the water pressure to the proportioner. Multiple in-line balanced pressure proportioners can be supplied from a single foam pump to protect several hazard areas. 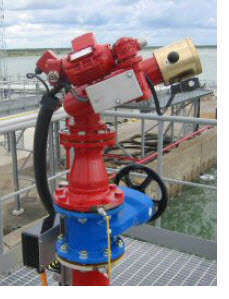 By adding an automated valve to each proportioner, either foam discharge or water only discharge can be selected. The simplest means of proportioning is accomplished by pre-mixing. With this method, pre-measured portions of water and foam concentrate are mixed in a container. In most cases, pre-mixed solutions are discharged from a pressure-rated tank using an inert gas such as carbon dioxide or nitrogen. An alternate method of discharge uses a pump and on-pressure-rated, atmospheric storage tank. The pump transfers the foam solution (under pressure) through piping or hose to the discharge devices. Only AFFF concentrates can be used with the premix or dump-in methods. Protein base foams do not mix as readily as AFFF and will gradually settle out of the premixed solution. Specially diluted alcohol-resistant concentrates are used in specific pre-mix units. In dump-in applications, ANSULITE alcohol-resistant AFFF concentrate should only be used when the booster tank is equipped with a circulation pump and complete mixing can be accomplished through the recycle line. A disadvantage with premix systems is that all the water is converted to foam solution. Other types of proportioning systems store the foam concentrate separately from the water supply so that either foam or water discharge is possible. A Premix system is ideal for protection of small hazards where suitable continuous water supplies are not available. Typical risks include Pump Rooms, Dip Tanks and Engine Rooms. Foam Proportioning refers to the introduction of a foam concentrate into a volume or flowing stream of water. Proper proportioning is essential to ensure the optimum performance from the foam liquid concentrate. The simplest means of proportioning is accomplished by premixing. With this method, pre-measured portions of water and foam concentrate are mixed in a container. In most cases, premixed solutions are discharged from a pressure-rated tank using an inert gas such as carbon dioxide or nitrogen. An alternate method of discharge uses a pump and on-pressure-rated, atmospheric storage tank. The pump transfers the foam solution (under pressure) through piping or hose to the discharge devices. Balanced Pressure Proportioning is the most common method used for fixed system applications where pressure or flow can vary with demand.There are two basic types – Bladder Tanks and Pump Systems using Balanced Pressure Proportioners. 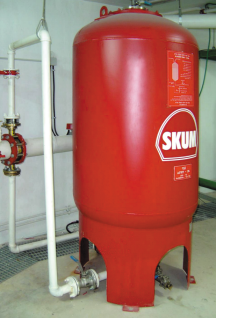 Bladder Tanks are the most common type of balanced pressure proportioning systems. The system uses a pressure rated tank with an internal rubber bladder. The foam concentrate is stored within the bladder and system water pressure is used to squeeze the bladder and provide pressurised concentrate to the proportioner. 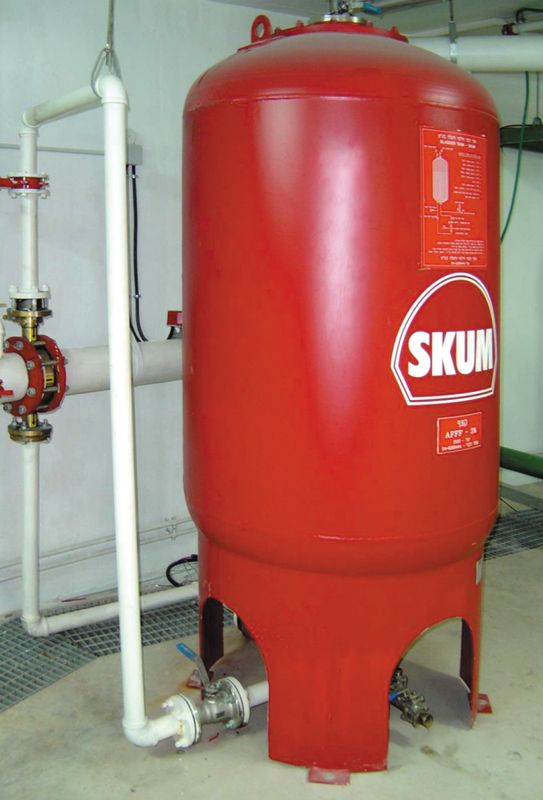 Bladder tanks come in a wide range of sizes from 300 us gallons to 3000 usgal in the Ansul Product Range and from 400 litres to 25000 litres in the SKUM range.Bladder Tanks provide a self contained balanced pressure proportioning system requiring no external power or foam pumping. Click on the links below to download information from our Technical Library – please contact us on +353 1 494 1429 to ask any questions. Tyco Safety Products Fire Suppression Group has unveiled a number of groundbreaking pieces of SKUM™ brand foam hardware: the new remotely controllable FJM-EL fog / jet monitor range, and the new HG high-expansion foam generators. They join a line-up of dependable and efficient foam fire protection solutions that are globally favoured for high value, high risk petrochemical, aviation, marine and power plant applications. The new FJM-EL monitors are powerful additions to the established SKUM FJM range. All three models – the FJM-100 EL, the FJM-150 EL, and the FJM-200 EL – offer exceptional flow performance, incorporate electric motor driven elevation and rotation and solenoid valve operated fog / jet pattern adjustment. However, it is the FJM-EL’s remote control operation that really sets them apart as fix-mounted monitors designed for the safe delivery of foam or water, either as a solid jet or a fog pattern.